Hashtags are often used on social media channels to discuss a topic of interest, share stories or media, and to engage directly with organizations people care about. Many of our members are using social media and it’s important to us that we communicate with you on the channels you prefer. We hope to use this hashtag to connect with you - our members - in new ways. You’re a real big deal to us and we want to hear from you. Tell us about a good experience you’ve had in a branch or over the phone and send us a photo when you see us out at community events. Remember, whatever your experience is, we want to hear it. 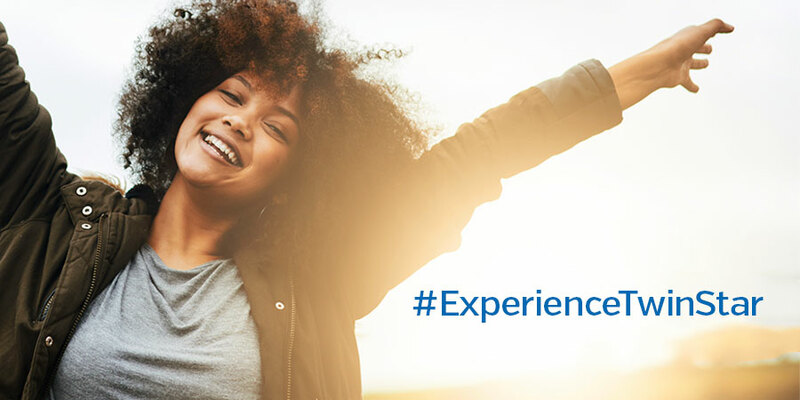 Use the #ExperienceTwinStar when posting on both your personal social media channels or on TwinStar’s official pages. To ensure we are able to see your post, check that your privacy settings allow businesses to see your postings. To properly use a hashtag, simply place a “#” symbol before a word (with no space in-between). This will allow anyone who clicks on the hashtag to view posts related to it. This also means that you can click on other people’s hashtags to view related conversations. We follow the rule “If you wouldn’t say this in front of a crowd in real life, then don’t post it on social media.” We hope that those who connect with us on social media understand that our community is family-friendly and will keep this fact in mind when posting to our social channels or using our hashtag. We want everyone to feel comfortable and safe on our social channels, and non-family-friendly language can really upset others. Have fun, be creative, and be yourself. Remember, you’re the biggest part of TwinStar and we care about your stories. To us, TwinStar represents community, and we want you to feel the same. Our employees are your friends, our members are your family, and our board volunteers are your neighbors. We invest our time, energy and resources back into the communities we serve. Our social community may be newly forming, but we’ll provide the same quality service you’d expect in person. We’re going to be posting photos, videos, and other updates about your credit union and community. Happy posting! We hope to hear YOUR TwinStar stories soon!